Wine, bar and spirits cabinets offer storage on off nights, and highly functional service on those nights when you entertain you and yours at home. 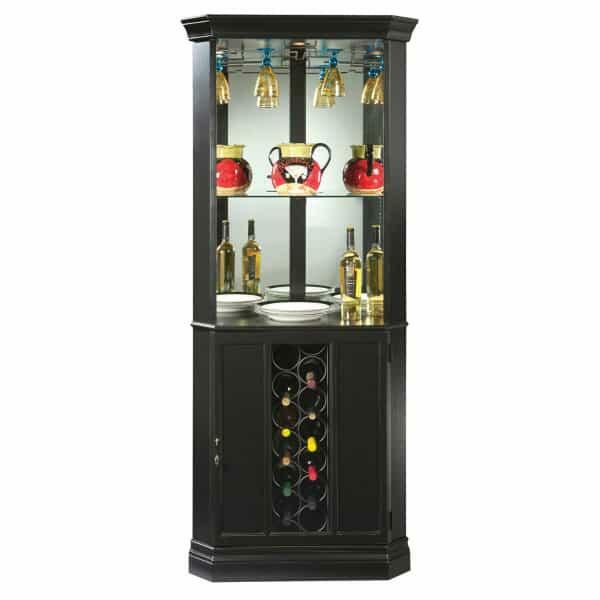 The full-length Piedmont II Wine Cabinet is traditionally styled and combines ample storage with a space-saving design. It slides easily into a corner space, making use of what is typically considered a no-go zone. The wine capacity has a 13-bottle wine rack and two fixed shelves for storage. There is a rack for hanging stemware for extra glass storage. The shelves can be easily locked with a pad-lock metal shelf clip for security. The cabinet may be placed on nearly any flooring, as floor levelers are adjustable for stability. A touch-lite switch offers four levels of lighting, and a glass mirrored back panel adds a touch of intrigue. Get all of your drinking needs and accessories together in one place, and find hidden functionality for entertaining.